A championship-style course that opened in 1929, Keller Golf Course boasts a rich history and tradition unmatched by any other public golf course in Minnesota. Keller has hosted several PGA and LPGA tours throughout the years. 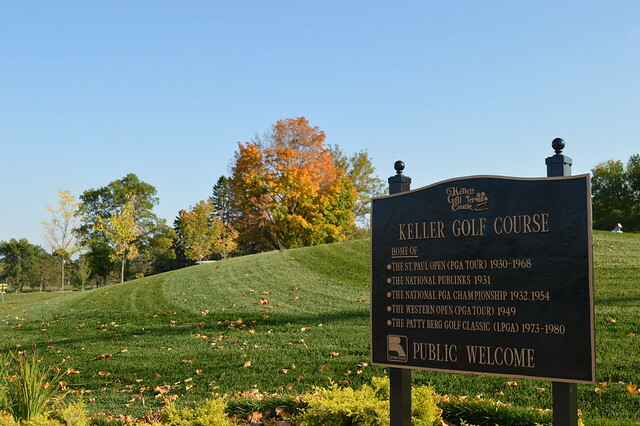 Keller reopened to the public in 2014 after a complete renovation that earned recognition as the Best Municipal Renovation of 2014 from Golf Magazine, and Renovation of the Year from Golf Inc. Challenging 18-hole course with all bentgrass playing surfaces. Full-length driving range includes target greens, practice bunker and chipping green. Keller Grille, a full service bar and restaurant, located in Keller Clubhouse. Year-round banquet and meeting space for private gatherings of up to 300 people with spectacular views of the golf course and Keller Lake. Private rooms feature an inviting stone hearth, stunning views, wood beamed ceilings, outdoor patios and private balconies. The Keller driving range will be under construction and closed spring 2019, with expected reopening mid-summer 2019. In season, Keller is open daily from 7 a.m. weekdays and 6 a.m. weekends until one hour after sundown. Times may be adjusted due to weather conditions. Available daily four hours before sunset or after league play is completed. Weekends and holidays after 1 p.m.
Saturdays, Sundays and holidays after 1 p.m.
Free with a paid adult Saturdays and Sundays after 4 p.m.
Keller offers group and private lessons for adults and juniors. Several leagues are also available; contact the clubhouse for league pricing and availability.